Question 1. Can Africa feed itself? Agricultural production in sub-Saharan Africa is hampered by low use of inputs such as improved seeds and mineral fertilizers, low inherent soil fertility in much of the continent, and nutrient-depleted soils. Farmers have traditionally cleared land, grown a few crops, and then moved on to clear more land, leaving the land fallow to regain its fertility. But a 3% annual growth in population—among the world’s highest—now forces farmers to grow crop after crop on the same land, “mining” or depleting mineral nutrients from the soil while giving nothing back, and to bring marginal land into production. Mineral fertilizers are the only practical way to restore plant nutrients and bring life to the severely depleted soils. But small-scale farmers, who comprise the vast majority of the farming population, have little access to fertilizers, and can’t always afford them. The African farmer must pay two to four times the average world market price for fertilizers. Worsening the problem are weak input and output markets, unfavorable policies, corruption, poor transportation systems, limited irrigation, and inadequate access to credit. Africa has great potential to increase agricultural productivity due to large area with high potential for crop production. At the current trends of population growth, cereal crop productivity must grow by 4% annually or more than double by 2020 to make SSA self-sufficient in cereal production. Renewed efforts to stimulate a green revolution in Africa by improving farmers’ access to improved seed varieties and fertilizer has contributed to dramatic increases in agricultural productivity in Malawi and Tanzania, resulting in surplus maize production. To build on and sustain this progress, an enabling political, policy and socio-economic environment will be required to ensure that farmers have good access to input and output markets. Question 2. How does agriculture affect African economies? Africa is a rural continent and agriculture is, by far, its most important economic sector. More than 70% of Africa’s population is directly engaged in agriculture. Sub-Saharan Africa (excluding South Africa) imported almost 20 million tons of cereal, at a cost of $4.4 billion, in 2004, according to the UN Food and Agriculture Organization. By 2020 sub-Saharan Africa is projected to import more than 34 million tons yearly, at a cost of $8.5 billion. Question 3. What are potential solutions to Africa’s agricultural crisis? UN Secretary General Kofi Annan has called for a “uniquely African” Green Revolution similar to the one that revolutionized agricultural production in Asia and Latin America. 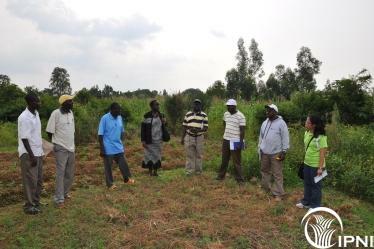 The increased food production was made possible by improved seeds and other inputs, especially fertilizer. High-yielding varieties of key African crops are available, but can produce well only if nutrients are available in the soil to feed them. Farmers in sub-Saharan Africa today apply about 8 kg per hectare yearly (excluding South Africa). Fertilizer is essential to catalyze the new African Green Revolution by adding nutrients and organic matter to improve crop production and restore soil health. African farmers will use fertilizer, if they have access at an affordable price—and if it is profitable. This means ensuring fair prices for farm products. Question 4 . Why are fertilizers so expensive in Africa? It is a cruel irony that a farmer in sub-Saharan Africa—where half the population survives, somehow, on about 65 cents a day—must pay two to four times the average world price for fertilizer. This is mainly due to geography and poor infrastructure. Africa has few navigable waterways, so bulky goods such as fertilizers must be transported long distances overland—on bad road and rail systems. Africa has the world’s fewest kilometers of paved roads per capita. For example, Uganda has 94 km of paved road per 1 million people and Mozambique, 141 km. In contrast, France has 12,987 km of paved road per million people and the United States, 20,987 km. Transporting fertilizers from an African seaport to a farm 100 km inland costs more than to ship those same fertilizers from North America to Africa. Also, the current low demand for fertilizer in Africa reduces potential economies of scale in procurement. Government policies, including those affecting tariffs and trade, often contribute to high prices. Question 5. Why not give away fertilizer free in Africa? Sustainable growth in agricultural production requires the development of markets, for both agricultural inputs and for farm products. In most African countries, less than a third of the food produced enters into commercial marketing channels beyond the local area. Also, it is often impossible for smallholder farmers to obtain reasonably priced farm inputs such as fertilizer and improved seeds. Simply giving fertilizer away would do nothing to develop the market. The alternative is for African governments to adopt policies and develop institutions that increase farmers’ purchasing power while also increasing access to farm inputs. For example, new financing arrangements could allow farmers to pool their resources, or make credit available at low risk, or that provide “smart” subsidies (rather than blank checks) to help farmers purchase fertilizer. In the case of the poorest farmers who truly have no other options, it may make sense to begin by using market-friendly, targeted subsidies for fertilizer, together with advice on its efficient use, to jump-start a process of increased production and profits.